Seqonomics: How is commercial sequencing getting on? How is commercial sequencing getting on? For DNA sequencing to fulfil its promise, it has to be become more than a tool of academic research. It has to enter the clinic, and eventually other areas where it can prove its worth, such as forensics or hygiene monitoring. How far along this path is it? The graph below partly answer this question. 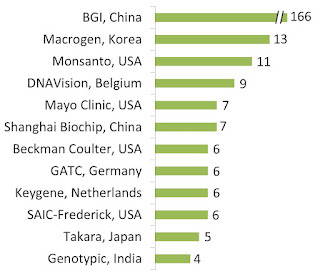 It shows the twelve for-profit companies with the largest number of next generation sequencers. Compared to the large academic sequencing centres like the Broad Institute with its 101 sequencers or the TGI with its 62 devices, the private sector is far behind in terms of sequencing capacity. The only exception is the BGI, which is somewhere in between a for-profit business and an academic sequencing facility. To me, the encouraging thing in the graph above is the diversity of business models behind the companies. 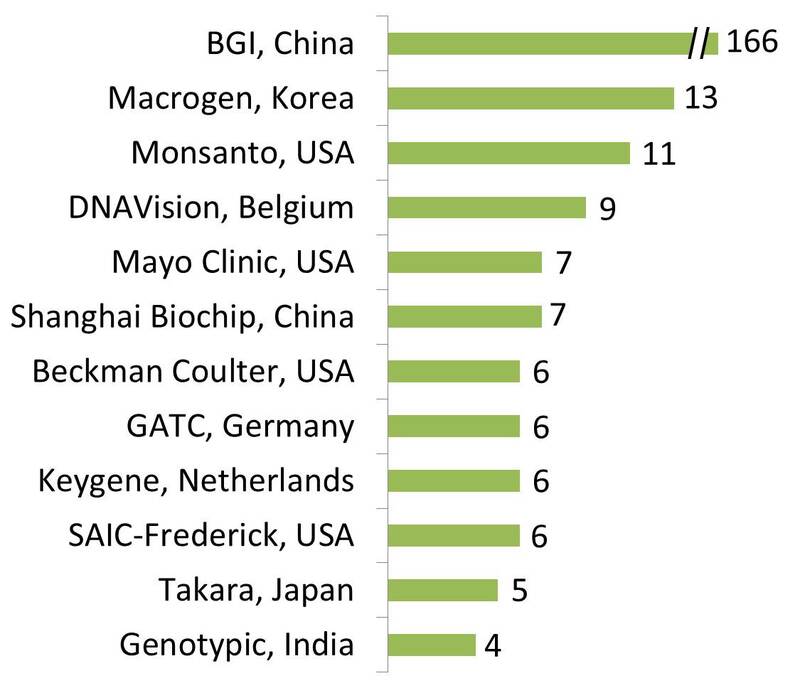 Although businesses providing sequencing services dominate (the BGI, Macrogen, DNAVision, Shanghai Biochip, Beckman Coulter Genomics, GATC, Takara, and Genotypic fall into this category), there are also agribusiness companies (Monsanto and Keygene) and health care providers (the Mayo Clinic and SAIC-Frederick). This indicates that sequencing is well on its way to leave its academic cradle and move on. The graph above is based on Omics Maps data from January and the figures have changed since then. Specifically, Source Bioscience (UK) and Fasteris (Switzerland) also have four sequencers and should therefore be shown alongside Genotypic. Expression Analysis (USA), which is owned by Quintiles, may have 12 NGS devices, and DNAVision may have sold two of their sequencers (see comments below). Hi, and thank you for your comment. My data comes from Omics Maps. According to that website, DNAVision has more NGS machines than GATC, which is what the graph shows. However, 4 of DNAVision's 9 sequencers are SOLiD machines, and therefore GATC may be number one in Europe in terms of raw sequencing capacity. Thank you for pointing out Source and Fasteris. They both have four sequencers and should therefore go to the bottom of the list - sorry for the omission. I unfortunatley don't have data for Atlas. Yes, DNAVision returned 2 out of the 3 HiSeq 2000 to Illumina. Hi, I have now added a note to the post with the info from your comments. Thank you for your feedback! Thank you, I'll add that in the post. If you are from Expression Analysis, you may want to update your information on Omics Maps as well.